While using the clipboard, one can be confused and enter some confidential data, say a password, in the text field of a search engine, the content of which will immediately be sent to the Internet. In order to avoid such an error, it is useful to have a permanent view of the clipboard content. 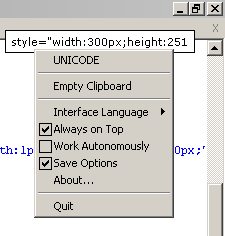 A program class called clipboard viewers provide just this functionality. The application presented at this page is a classic clipboard viewer. Its distinctive feature is the small window size. The window shows one text line upon 30 characters either as a Unicode or as an ANSI string. If the clipboard is empty or contains any non-text data, e.g., a bitmap, the viewer does not show anything. Tab characters as well as carriage returns are ignored. If the text editor screen shows 20 empty lines and the text starts at the 21st line, then by copying 21 lines to the clipboard the viewer displays the 21st line. If the menu option Always on Top is set, the program will be displayed over any other window except windows that have the same rank, e.g., the task manager or the task bar. In the latter case, the windows order depends on which window was clicked last. By default, the application does not write anything to the disk or to the system registry. If the option Save Options is set, the program saves its screen coordinates at the time of closing to the registry. Next time, the program will appear on the screen at the location where it was displayed before closing. If you decide to remove the program file, you should clear the option Save Options first. Otherwise, the corresponding item remains in the registry. If the viewer is launched on Windows XP, the context menu displays an additional option Work Autonomously. In Windows XP applications that work as clipboard viewers depend on each other (clipboard viewer chain). When only one of them is buggy, the others can stop working properly. When the viewer does not display text snippets that are copied to the clipboard, you should set this option, which will possibly help. If everything works fine, you should not activate the option since the CPU consumption is slightly higher then. Some applications need more time than usual to render the new clipboard content. In this case, a time lag occurs when the old content disappears and the new one is displayed.